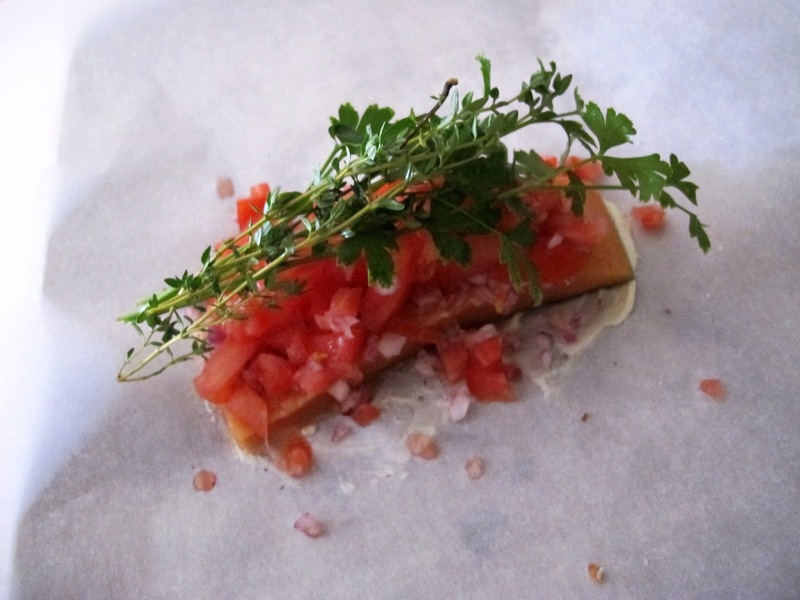 Julia Child’s 100th Birthday — Salmon Fillet en Papillote with Shallots and Tomatoes: Fast Food! So to celebrate Julia’s 100th birthday (along with everyone else in the world), I had to come up with something on the web. 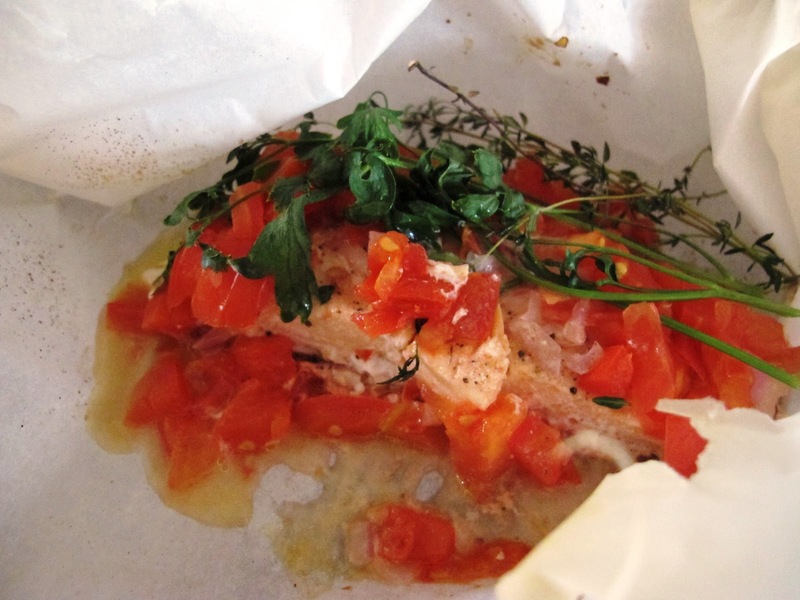 Salmon en Papillote with Shallots and Tomatoes seemed perfect. Since I had salmon the freezer. And I was alone. Fish is perfect for one. 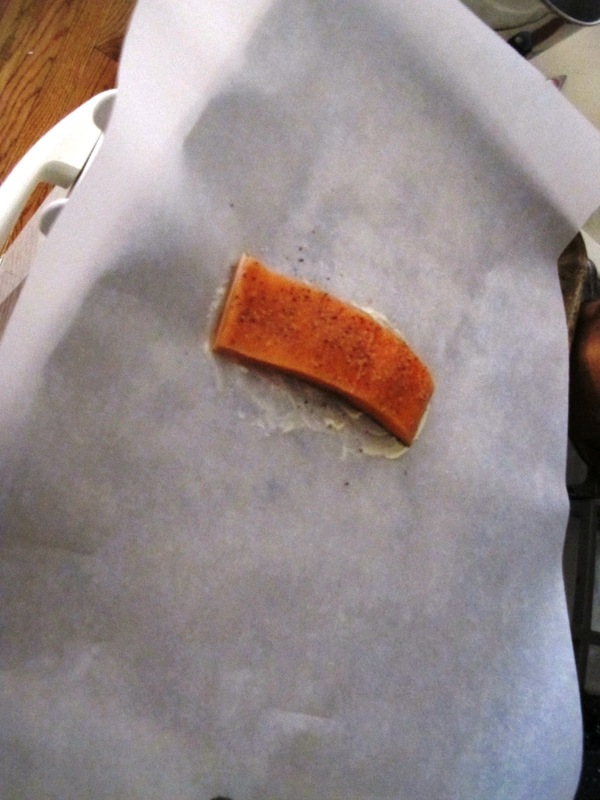 While grilled salmon is the standard summer prep in the U.S., I’m here to tell you that you just might enjoy wrapping that little piece of fish up in parchment paper and throwing it in the oven. Almost feels like a little craft project going on. 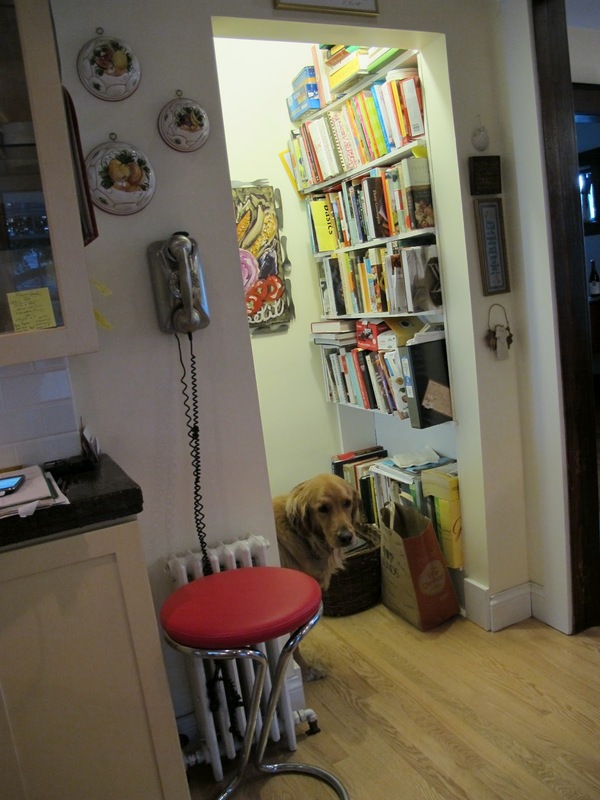 The oven is not on long enough to heat up the kitchen. The resulting fillet is tender, toothsome, done perfectly, and seasoned elegantly. And if you don’t pour a loving glass of Pinot Noir or even a Syrah to go along with, I’ll be unhappy. I will haunt you. See below for the recipe that’s faster than calling for pizza. Quicker than driving through the drive-through. 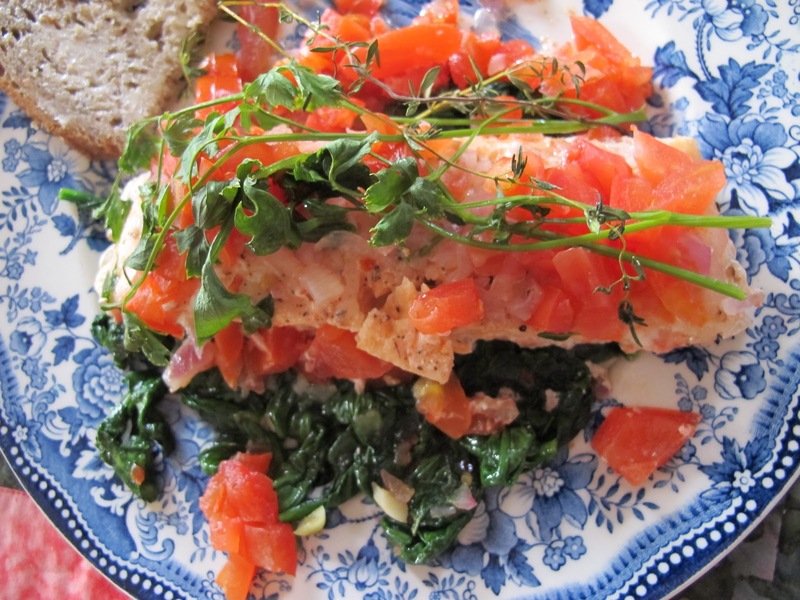 By the time you set the table and sauté some spinach, dinner is D-O-N-E. If you’re still set on grilling, you could probably use the same recipe for the grill, switching foil for the paper and going the Girl Scout route. Thanks, Julia. I know you’re enjoying the kitchen that never gets hot, where feet never hurt, European and American measurements are the same, knives are forever sharp, tupperware bottoms and tops always match, and watched pots do boil. God speed. Season with salt and pepper. Top with shallots, tomatoes, and fresh herbs. 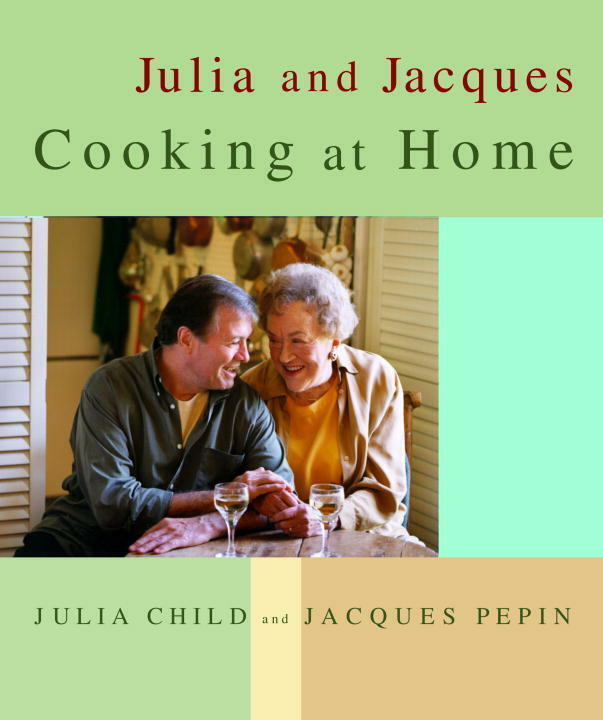 An aside…My favorite Julia Child recipe is French Bread. Really. A story for another day. Wrap up and pin or staple as I did. Bake at 425 degrees F about 8 minutes. Et voila! 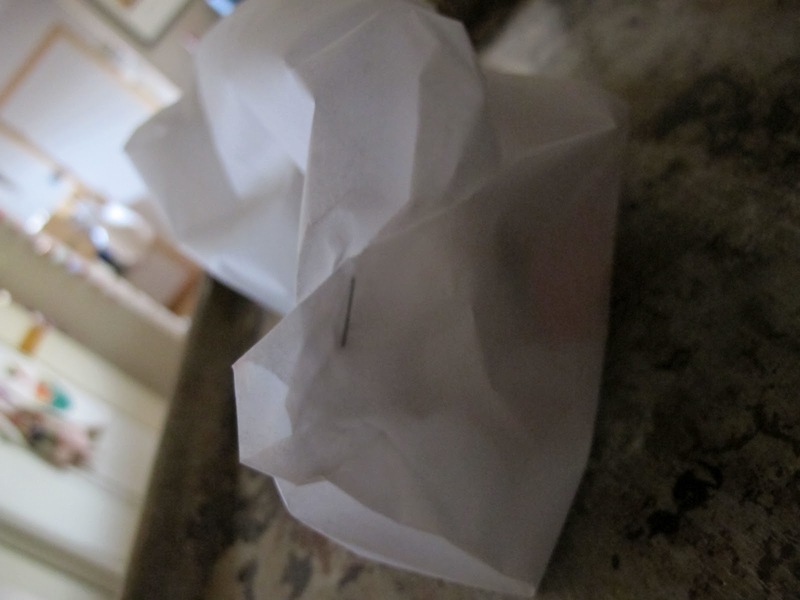 Jacques’ method for wrapping the fish in paper includes leaving a hole, inserting a straw, and blowing up the paper “balloon” before baking. I went with Julia and even changed that. As long as you get the paper packet sealed well, you’ll be fine. salmon fillet. Scatter the parsley leaves over and around the fish. than an inch thick, or 10 minutes for a thick fillet 1 to 1 1/4 inches thick. alongside the fillet, and slide the fish right onto the plate. while the salmon cooked in the oven. 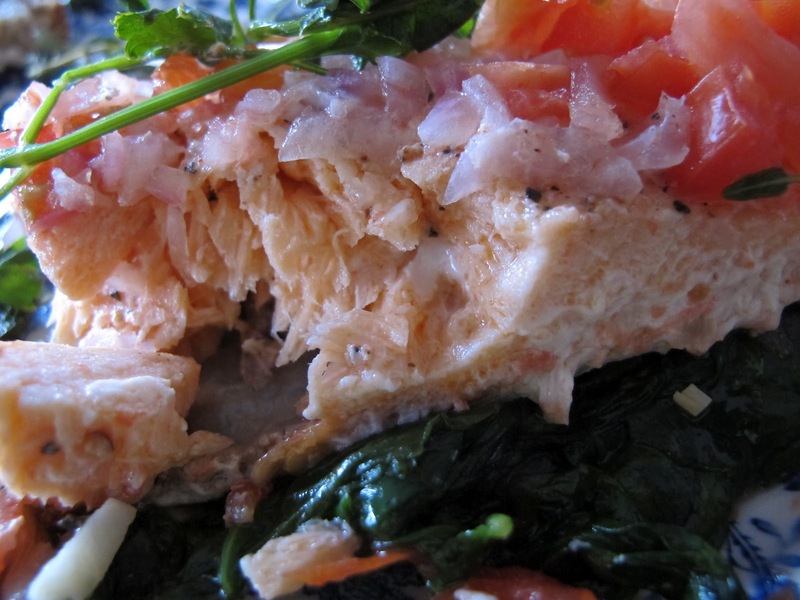 One pound of fresh spinach will cook down to one cup of cooked spinach. I think I cooked about 3 ounces of fresh spinach for me. I stirred in some hunks of garlic at the end, but started with a little crushed red pepper in the olive oil. Do as you like. This, along with a small piece of buttered whole wheat bread, rounded out the meal. 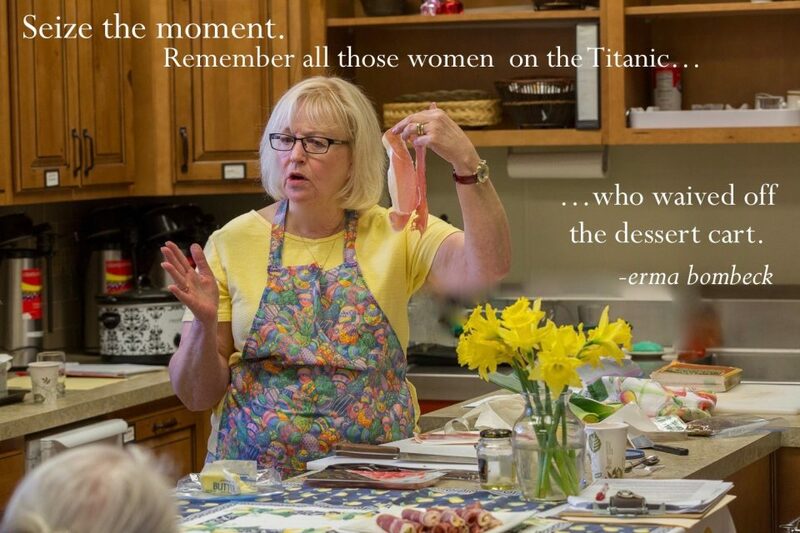 Along with the wine, of course. Ready for its close-up. Done, but oh-so-tender. Just perfect. Just Julia. Cook’s Note: Whole Foods in Colorado Springs sells their gorgeous wild salmon frozen in individual pieces for four bucks and change. I guess they’d rather freeze it than throw it away. 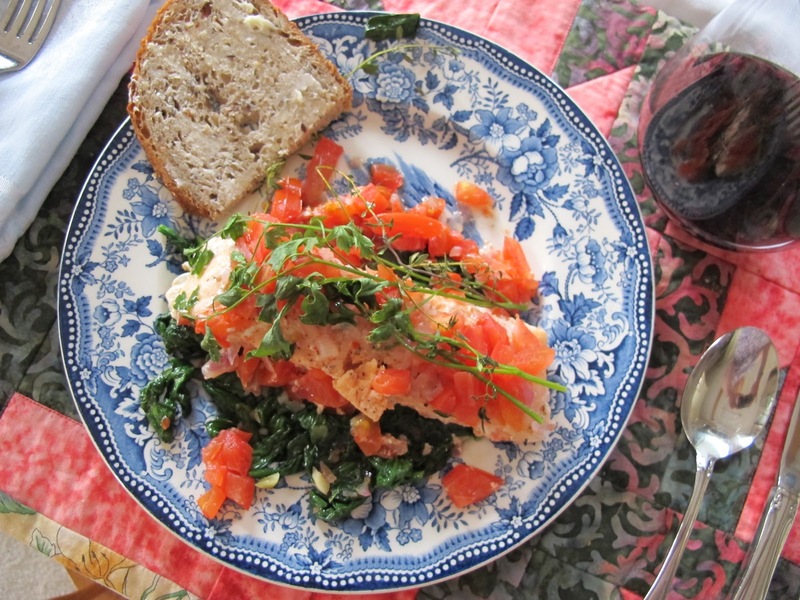 This salmon is luscious. I throw it in a covered soup pot on the front porch for 30 minutes or so (summertime) and it’s unthawed. I have also cooked it stone-cold-frozen on a very hot grill indeed. I love fish in papillote. It's a fun way of eating fish. Yours looks so lovely on that beautiful blue plate. Thank goodness for anniversaries! I like fish in paper, too. Tender,juicy–easy. I love those blueplates!